Yesterday I was getting ready for a meeting and I decided to elevate my relatively simple grey outfit with my newly acquired Giselle Earrings from Ana Luisa NY and I got asked about those earrings so many times that I had to share it with you guys here. They are made with sterling silver and everything from the design to the setting of the crystals is outstanding. So, today I decided to share some beautiful jewelry pieces from Ana Luisa NY and wait till you see the pics to admire how elegant these pieces are. I picked the Tia Large Hoop earrings which is 14K gold plated and the Giselle Earrings which are made with sterling silver! Absolutely impressed by the craftsmanship on these jewelry pieces and how stunning they look. They elevate the simplest of my outfits and the quality definitely shines through and they are quite affordable for many of us. You can also sign up using the button here and use code Ruqaiya15 to get $15 off your order. Jewelry has always held special significance in my life and most of the pieces I wear, are given to me as a gift by my loved ones so whenever I wear something from my collection, I am reminded of how much I am loved and it quickly cheers me up. When I came across Ana Luisa NY, I was completely captivated by the large selection of very 'good looking' pieces! Their fine jewelry is made with real silver and real gold and it is so wearable and affordable that anyone can easily add these to their collection. Hoop earrings have always been a staple in accessorizing my look and the Tia Large Hoop earrings make it a bit more special. They are 14K gold plated and they fit perfectly on my face. They also come in a medium but I love this size as it makes a little bit more of a statement. Its 2.6 inches in diameter and feels quite substantial and elegant. I can pair these with a simple skirt for evening or with jeans and a light tee shirt for day. I wear these almost every other day because it works well for most occasions!! They were my first pick from Ana Luisa because there is something so edgy about these elegant earrings. The clear crystals set in sterling silver that sparkle and reflect every bit of light that touches them. They are appropriate for work and with the addition of a necklace, they quickly become a little more precious for more special occasions. They look so sophisticated and it is always a little more special to wear something in real gold or real silver than the designer label metal/strass/glass rendition and at a price point that is affordable for many of us. These earrings are only $100 which is a great price point for something so perfectly crafted. I usually shy away from bright colors even in summer time but I love to add pops of color in my outfit through accessories. The Olivia Tassel Earrings add just enough pop of yellow to brighten up my face and gets me summer ready. I recently wore this to a picnic at the lake with my family and the laid back matte gold look of these earrings added beautifully to the casual setting of our getaway. I love wearing this with dresses but I am sure it will look great with any summer outfit. They also come in pink tassels which I would to add to my summer collection. 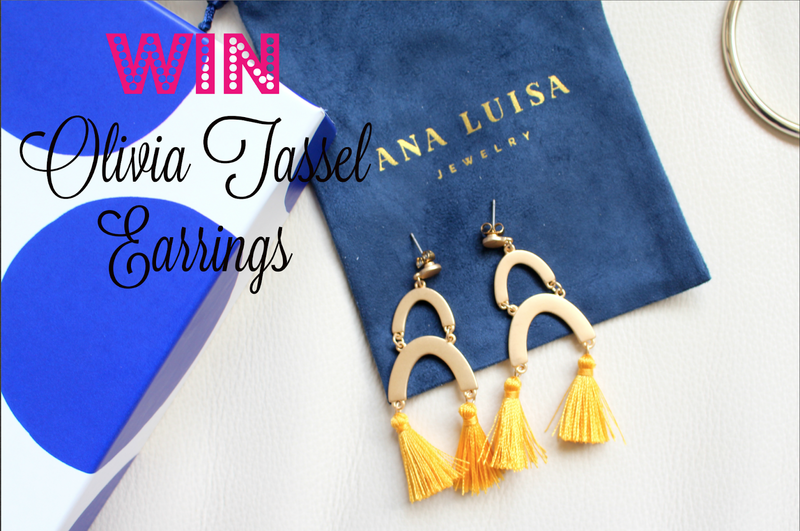 If you like the Olivia Tassel Earrings, you don't have to do anything more than comment below on this blog about why you like these earrings and if selected you will be receiving this in you mail soon! Contest closes on August 23th, 2018 and winner will be announced by August 25th, 2018. Open to US and Canada only. Hope you like these earrings from Ana Luisa and do share what you think about these in the comment below to win yourself the Olivia Tassel Earrings. You can also sign up at Ana Luisa and use code Ruqaiya15 to get $15 off your order.